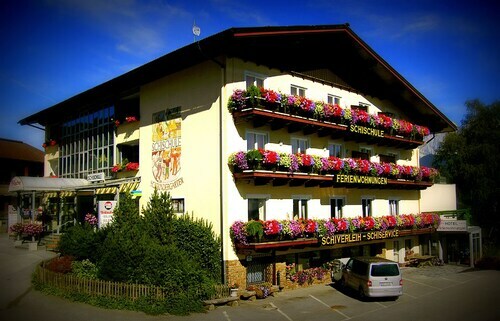 Located in the mountains, this Schladming hotel offers ski-in/ski-out access within 3 mi (5 km) of Schladming Main Square and Planai Hochwurzen Cable Car and close to winter sports such as cross-country skiing and snowshoeing. Dachstein Glacier is 13 mi (21 km) away. 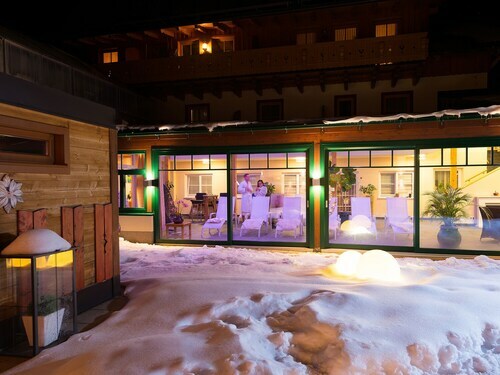 Located in the mountains, this ski-in/ski-out hotel in Schladming is within 1 mi (2 km) of Planai and Hochwurzen Ski Area and Schladming Dachstein Ski Resort and close to winter sports such as cross-country skiing and snowshoeing. Riesachfaelle Waterfalls Trail and Schladming Main Square are also within 2 mi (3 km). Situated in the mountains, this property is steps from Planai and Hochwurzen Ski Area and Schladming Dachstein Ski Resort. Riesachfaelle Waterfalls Trail and Schladming Main Square are also within 3 mi (5 km). Pet lovers shouldn't miss the chance to visit Rohrmoos-Untertal, a family-friendly city known for its coffeehouses and mountain views, as well as attractions like Duisitzkar Lake and Planai and Hochwurzen Ski Area. Choose from Travelocity's 5 pet-friendly hotels and accommodations in Rohrmoos-Untertal and bring your four-legged friends along! If you're planning a visit during winter, check out Schladming Dachstein Ski Resort. Other things to see include Riesachfaelle Waterfalls Trail, Schladming Main Square, and Planai Hochwurzen Cable Car. For vet care, Dr. Matthias Brandstätter, Mag. Gertrud Trinker, and Praxis für Tiergesundheit. Mag. Celia Schmitz are located in the area. Pets are allowed for a fee at this 4-star hotel. Guests appreciate the breakfast and WiFi. Weather can make or break your stay, especially if you want to spend time wandering around the city. We have gathered the average temperatures to help plan your trip in Rohrmoos-Untertal. From January to March, average temperatures range from 53°F in the daytime to 26°F at night. Between April and June, the daytime average is 74°F and the nighttime average is 37°F. From July to September, average temperatures range from 76°F in the daytime to 46°F at night. Between October and December, the daytime average is 63°F and the nighttime average is 26°F. We had a great stay and the staff was awesome! They were very accommodating with several special request we had. Your Spacious Apartment in Schladming-rohrmoos With Pleasant Mountain Views!